Today's guest is Stephanie Freeman, author of several books including A Letter from Yesay, Necessary Evil, and Nature of the Beast. Stephanie: By day I am Ms. Freeman, an educator helping people piece their lives back together after a job loss. In my many incarnations as an educator, I’ve worked for the city, the state and all parts in between. When I remove the ink pens I’m known for winding in my hair, I am Stephanie an artist at heart that lives and breathes the written word. Nothing brings me more pleasure than writing. When it’s good the bliss is almost painful. You never want it to end. It’s like falling into eternity: heaven and earth change places. I am surrounded by a host of friends and family and two male cats Socrates and Aristotle. Stephanie: I began writing when I was a little girl. I was always fond of the question, “so what happened next?” In the beginning nearly all of my stories were a continuation of some television show I saw or some movie. My mother was my first critic. She liked my stories well enough, but she would always send me back to my little desk with the same bit of advice. “Tell your stores, your way with your words and let the rest fall away.” That advice has served me well over the years. Tricia: Let’s talk about A Letter from Yesay. Can you tell us about the book and how you got the idea for it? I’ve always had a halting respect for the written word. I believe that the act of letter writing is a lost art. So much can be conveyed in a few chosen words. 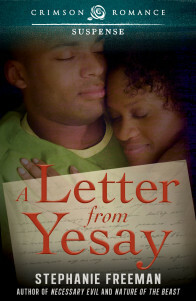 When I sat down to write “Yesay”, I wanted to tap into that art form. I wanted to know if a letter really had the capacity to draw two strangers together in a way that was beyond what either imagined. I found my answer! Tricia: Necessary Evil has received rave reviews. Can you tell us about the premise for the book? Stephanie: The premise for Necessary Evil was simple. Can a crime of passion ever be considered an act of compassion? I love to pose a philosophical question and journey through the book with the characters in pursuit of the answer. The main characters were bound together in a way that transcended the conventional.. I wanted to know if such a connection could exalt or destroy. Tricia: Okay, let’s take a look at Nature of the Beast. What is this book about and what special challenges do Willow and Davis face? Stephanie: Me and my questions.... 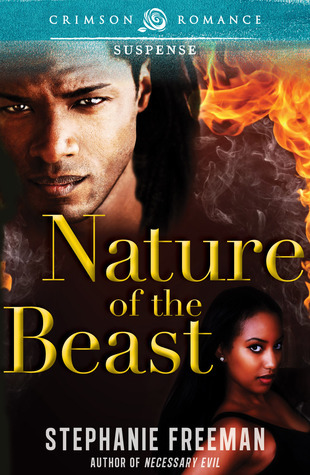 Nature of the Beast poses the question, “Who are you, really?” In this book the characters are changed in a visceral way by a savage act. The biggest challenge the characters Willow and Davis face is answering that question. On the one side of the spectrum, we have Willow who is a no nonsense arson investigator who had all but cut off her personal life and her feelings because of a tragedy in her childhood. On the other end of the spectrum, we have Davis who is plagued by a truth that haunts him; a truth that could kill them both. In this book both characters are struggling with their identities. Are they better or worse because of the tragedies they endured? Stephanie: At present, I am working on several different projects including two romantic suspense novels and two inspirational fiction novels. Stephanie: For me the most challenging aspect of writing my novels would have to be letting go. There are some characters that linger with me. If they linger long enough then I toy with writing a sequel usually some short story that will quiet the character a bit. Tricia: Of all your characters from all your books, which one is your favorite? Why? Stephanie: Alana Symone from Necessary Evil is my all time favorite. By far she was the most tortured soul I had ever “met”. I am of the Toni Morrison school of thought when it comes to characters. Sometimes the characters just come in and sit down beside you and tell you their story. Alana Symone didn’t sit down next to me at first. She crouched in the corner watching me for months. Eventually she moved closer and a story was born. Stephanie: I read the classics, Caddie Woodlawn, The Little House books, virtually anything with a strong lead female character. I cut my serious writer’s teeth on Stephan King, my mother handed me one of his books and said, “You’ve gotta read this!” I adore Maya Angelou , Zora Neal Hurston Langston Hughes and Toni Morrison because of their way with prose. Other favorite authors include Patricia Cornwell and Steig Larsson because of their dark gift for making the horrific almost conversational. Shakespeare and poet Dylan Thomas... there are so many... far too many to name. The poem the Second Coming by Yeats still sends chills down my spine. My mother prided herself on good books and she instilled the same values in me. Stephanie: I never respond publicly. I sift through the venom for legitimate complaints if there are none then I let them roll off my back. In some instances, I look at them as a balance. Above all else, I know they are inevitable. Best way to combat a bad review? Write another book. Tricia: Do you listen to music when you write, and if so, what songs/artists are on your playlist? Stephanie: If it’s a steamy love scene then it’s Marvin Gaye, Brian McKnight or Tank. My tastes are eclectic. One minute I could be listening to Bach’s Toccata in Fugue and the next I could be listening to Van Halen or classic Ozzy Osborne. The stories dictate the soundtrack. I’ve often toyed with the idea of listing the music I listened to at the beginning of my books so that my readers can “Get in the Mood”. Stephanie: I offer then the same advice my mother gave me in the beginning. Write your stories your way with your words and let the rest fall away. No one can write the stories you write. Only you know your characters and the language that will best convey the message you are trying to get out there. Develop a writer’s skin. Critics have a peculiar talent for cutting deep enough to grate bone. I won’t say it won’t hurt, but the thicker your skin the better your muse and your own psyche will be protected. Be mindful: critics can come in the form of friends and family. Write anyway. Write if the only person reading it in the beginning is you. Trust and believe, you write like that and the world will sit up and take notice.